LN Simon, can you talk about the nature of ambiguity in your recent work, and how that punctured flatness, and imperfect geometry, is informed by the impact of the Welsh landscape? SC I am not sure what you mean by the term ‘ambiguity’. The word that comes to my mind more is ‘contradiction’. A series of ‘contradictions’ occur in the work during the making process and the work is transformed from one kind of condition to another. LN How does that transformation take place for you? SC With this particular group of works, which I call ‘flat paintings’, the point I am trying to make is that flatness – which has always been a key defining quality of painting – is now just one of a number of possible qualities. In this show I wanted to suggest it is now possible to choose to make paintings flat. If you consider that my previous works set out to challenge flatness as a prerequisite for painting… The questioning of flatness, which I believe is very important, is that I recognized that flatness is the product of image-based painting. It had to be flat to communicate as clearly as possible. I am not working with images so there is no reason why it has to be flat, although in this case – through a sense of contradiction – they are flat by choice. LN Can you clarify why that sense of choice is important to you? SC One of the things which is very important to me is to continue to ask: what is a painting, what is its function, its role? When I was growing as an artist, there was a backlash; a wave of anti-painting from all directions, everybody was climbing on the bandwagon waving their hands and saying that painting was dead. It made me want to question and define what makes a painting and what makes painting unique. I began taking it apart, questioning those roles from a contemporary viewpoint, redefining, reassembling, and re-casting its function. LN And in these particular paintings, how are you re-casting that function and role? SC This particular group of paintings originated in the landscape in North Wales. They developed and grew out of a collaboration with archaeologists from the Institute of Archaeology, University of Oxford, on site. The first thing I did in response to this landscape was to take a roll of canvas up the hill. I had the raw material and I was thinking in terms of impregnating colour into the canvas, developing some kind of relationship with the landscape, although it was not a representation of that place; ideas were coming from the experience of that landscape. In terms of the works here, I had permission to lay the canvas over the surfaces of the archaeological trenches. I would cut up the roll of canvas and place lengths of it over the trenches after the diggers had left for a break or at the end of the day. I would make my way over it by hand, marking and recording the features I could feel through the cloth. LN Is that a kind of system you have developed, or something systematic? SC It’s not a process, it’s not systematic: its very organic and is a response to a given working situation. It can all change within a framework. LN So ‘framework’ is the key word here? SC The kind of framework that allows an examination of what a painting is, what it can do, and where is its place. ‘Place’ in terms of geographical place, but ‘place’ also has another meaning – where is the place for painting, and the place for the viewer? Maybe not at eye level; these are not images, so they do not have to obey those conventions. So, if I make a work that is very low, then maybe that work can be for the viewer’s leg. These are not images swathed in conventions; I try to invert painting – putting my hand inside the work and pulling it inside out to see what’s revealed. I have the word written on my studio wall: ‘invert’. LN So does that mean there are some kind of rules or thoughts that you always come back to? SC It’s not a rule, it’s a goad, an ambition, provoking me to push at it. LN That provocation seems critical in terms of your decision-making. In connection to temporality, Gaston Bachelard states: “Our past is situated elsewhere, and both time and place are impregnated with a sense of unreality”. Can you say something about the immateriality of memory, or perhaps in your case the industrialization of memory? SC My kind of understanding of temporality comes out of a long time working with archaeologists. I understand temporality through material. Time is material. It’s not an abstract concept. Time for me is tangible as a response to a material environment. In terms of painting, these sorts of ideas can play out if you remove ‘image’. I am deeply interested in things that communicate slowly. How do you make the viewer’s perception slow down, how do you get someone to navigate around a painting? I am thinking about what physical qualities in the work and strategies cause someone to move from one side of a painting to another side; a balanced bodily response involving all the senses, slowing down and creating the opportunity to be aware of our perception. LN How do those physical strategies work alongside the idea of the archaeological dig? Is spontaneity key for you? SC You might set out with an idea. You are lying in bed at night working on an idea, it is exciting and it keeps you awake. Next day, within 45 minutes, the reality of working with that idea in the studio has failed, and so it should. A few people are able to carry things out in terms of a plan and make it work. A young Frank Stella comes to mind, I have seen photographs of him working; there appears to be no sense of doubt. I am a different sort of person, any number of options come into the equation, creating doubt and mucking it all up. The work emerges from playing with the options, this is the real exciting part. LN The colour in this particular set of works seems saturated, and stained very deeply into the fabric. How does that take place? SC That’s quite technical. When you buy canvas it has size embedded in it. In order to weave the canvas the manufacturers have to put size in the cotton to stiffen it. The first thing I do is to wash it out. I want to make the material my own. The distemper comes out dark yellow and I am left with a soft and clean cotton. I then use my own distemper: rabbit skin glue and a lot of dry pigment. I mix it up and soak it into the surface. This allows the pigment particles to get caught in the fabric. It’s not a one-off action, I can knock back the colour by washing it down again. LN And did that come about by looking at other artists, for example Morris Louis or Jules Olitski? I am thinking of works such as Morris Louis’ maybe Loom 1958, or Olitski’s Greek Princess – 8 1976, which has two sections. SC I remember seeing a fantastic Morris Louis in the Louisiana, Denmark, one of the poured paintings; they have a different quality. I saw a Olitski the other day at Gagosian in London. I liked it very much – it is one of the first ones I have ever seen. Not sure there are any in this country, does the Tate have any? LN They have a large poured work: Instant Loveland 1968 -it’s not on display at the moment. Possibly one of the largest canvases he has executed. SC As soon as you start doing something that comes close to something someone else has done, your hackles go up. You have to adjust your approach so as not to repeat. LN So is it like a calculated escalation, the way the colour is seeped into the object? SC If there is a calculation, it’s not a mental one, it’s bodily. I know when something is right; my brain doesn’t tell me, it’s not conscious, but I feel it’s right. That sensitivity of knowing something is right comes out of years and years of becoming sensitized to painting and to materials; you can trust yourself -even though the work might not appear anything like you expected it to be. It can still be right. LN And that relationship through colour, within the whole sense of the show, those relationships? I read something where you emphasized Rothko’s approaches? SC Everything has been completed over the last 6 months. 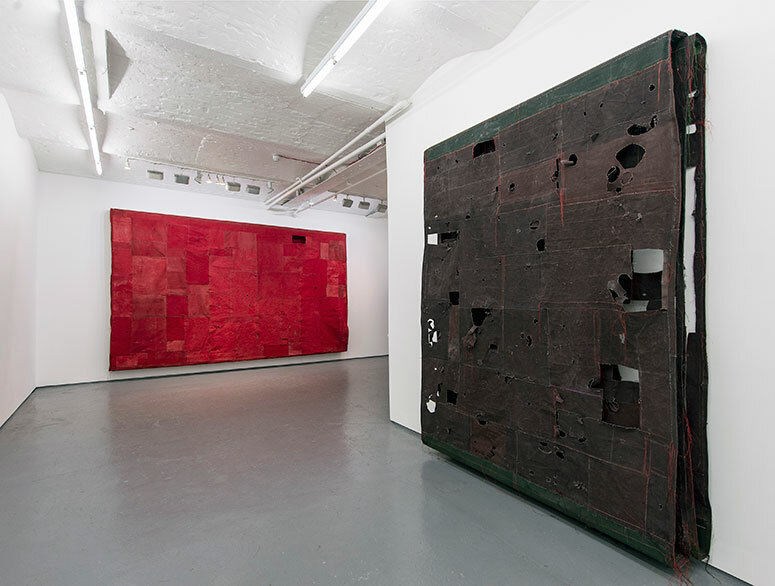 The red painting is the earliest one; I had bits of that canvas in the studio when I went on site two years ago. I wanted to get the pigment right into the fabric. LN The colour does seem even more densely in there than in the past? SC The distemper surfaces could be very vulnerable in past paintings. I found a way of putting oil on distemper – this is something that Rothko did – allowing it to draw out the oil and drying as a matt surface, in Rothko’s case often matt surfaces next to high gloss. LN In these works that’s not quite the same? SC This darker one is less washed out. I worked straight into the canvas with caput mortuum pigment (iron). I did not wash it again. It was left out in the damp weather on the Welsh hills. The size was strong enough to resist a bit of bad weather and it has a rigidity compared to the other painting, which has been in the washing machine. It’s really been through it. It has got a very soft quality and it has been saturated with mars red, which is similar to rust. LN The other thing I am picking up is the grid of imperfect geometry in the darker one. I am very interested in how that soft colour might combine with it; it seems to me to have the quality of, say, someone like Tapies in that sense of mobility, volatility and mutability. Can you say something about the unpicking of the surface facture? SC I like Tapies very much. With these paintings I am getting back to working more with the front surface. I had arrived at the point in past paintings of an all-over monochromatic front surface, although not in a conventional way. I wanted to re-introduce line by cutting into the canvas. I wanted to have holes so you could see through them into the body of the work. I wanted to use coloured line by drawing with thread, in a semi-practical way. I wanted to puncture the surface so that access to the interior was not just through the loop where you can see from the side. Now the holes in the front of the work allow the interior to be as significant as the front face. LN Is this the first time that the puncture has entered your practice? That this return to a closer wall-based thinking has introduced a state of collapse, and an authentic remnant? SC I had made some floor-based punctured paintings, but this brings that feature right back to the centre of the work. I like the idea of using the conventions of painting to dismantle a painting. I want to take apart the built structure. I am at this point where the interior of the work is very exciting; you don’t normally get to do that with painting. In these works you can see right back to the wall. I want to see how much I can take out and if it will still remain understandable as a painting. LN Can you say a little more about how the drawing works – and getting inside the form? I like the little violet set of stich-marks against the ostensibly red ones, juxtaposed against the densities of pigment. You do it all? SC I do it all. But I try not to get too aesthetic. When I work I will reach my hand out for material and I could find a green thread or a black one – it doesn’t really matter – once the whole process is set in motion, a different colour of thread could come to hand and it wouldn’t matter. I try not to get locked into things that appear important but are not. The main thrust of the work is often there at the beginning, and worrying at detail will only ruin it. LN I get that kind of approach, it allows a chance element into the work. I really like the way the thread is very casual in appearance. It adds to the illusion of the way the work is presented and hung, its floating sense. SC The paintings float in the same way all paintings float on walls. It’s the standard illusion. These works do not reveal too evidently how they are hung. Although if you look you can see; it’s not hidden. LN There seems to be a molecular idea, or momentum, which is always challenged by the minimalist constructivist mirroring of elements in work, in maybe someone like Robert Adams with his Large Screen no. 2 1962 in bronzed steel. Or George Dannatt’s White Reliefs 1979. SC I don’t know Adams, I will have a look at him. I have looked at mainly the Russians, El Lissitzky, etc. Nicholson is too pretty, Cubism is really good, Constructivism I find really exciting. Fontana started a bit of the story, hiding the interior by putting a bit of gauze behind the surface; he was not interested in what it revealed. I think I have taken that a bit further though, in a spatial sense. LN That sense of collaboration with the people who are close to you, the whole operation, and those whom you have worked with over a long period of time, seems highly significant. Can you say why that’s important? SC It really feeds me. It’s only two weeks a year that I go on site. I have been working for many years with Gary Lock, an archaeologist from the University of Oxford. The conversations with everyone on site are really important when thinking about landscape. They are far more advanced than the art world. I don’t dig; I keep at a distance. They don’t often know what I am doing, and it’s difficult to explain, because I often don’t know what I am doing. Ideas form on site and works take shape in the studio during the year. But importantly for this show, it’s important to talk a little about the archaeological trenches. They can be immensely complicated spatially – they might superficially have the form of a painting laid flat on the ground, rectangular and with a physical depth like a painting. But it’s only interesting for me when I start to think about it spatially, and how features from the bottom surface project into the interior volume. When I place my canvases on these surfaces to mark them I am very aware of the material and I am learning to be aware that the interior is as important as the exterior or front surface. LN When I first saw this show I felt very strongly about your early works. I remember seeing your works at the Tate Art Now exhibition. How does that fit in? SC The early work, my white paintings – some people might see what I am doing now and might not see a relationship between those works and the works in this show. From my point of view I can see the logic of how these new works relate to those early white paintings. It was with the white paintings that I began to register the materiality of the painting as primary, over image. These current works have taken on the idea of materiality in contemporary painting and have gone much further with it. LN So, we have not really considered this work: Wall Spine. How does that operate? Does it function slightly differently? SC It’s a different kind of work. Although on some levels I am trying to engage the audience with a similar strategy, which is its, and their, physicality. You measure yourself up against the work. It’s got all these repeated interior spaces, which are much more pronounced because they are forward-facing. I still call it a flat painting because it’s still got a flat front surface. The fact that it projects out by almost a metre gives it its individual character. LN But I suppose it’s got a different kind of rhythm. That’s what interests me in relation to these other works. SC It’s very linear. When I was working on it and began to put the different sections together it created its own line. You can’t order it; it orders you. There is a lot of material in this work. It is 125 metres of canvas that has been cut up, saturated in distemper, formed and sewn, and it does what this material does. It’s the same with any other material, it’s like trying to make paper flat when it wants to curl; you’re mad if you try to get it flat. What it does is what it is. If I force too much onto it then it’s a frustration for me, and for the viewer, and it doesn’t work very well. It’s all about allowing the material to be itself – this creates a better work and a better experience for the viewer.